The importance of online presence in today’s rapidly growing era of information and technology, in any case, cannot be neglected. Today Websites are a handy tool for any kind of business ventures no matter how big or small business you are running. Like many others, I am sure you also have a website to provide your customer a better way to engage with you and find your products and services. However a common question comes to every one of you many times thinking “How Do I get the Most of my Website”?” “What is wrong with my website”? “What do I do to convert my user to my client”? Sometimes it’s a simple fix to get the most out of your website but sometimes you need to completely redesign your website. But before revamping your whole website you have to check either you want a new website or your website need a simple fix. Because after all, you are going to invest on redesigning your site. To help you decide which option is best for you, here are some questions to ask before redesigning your website. 1. What is wrong with my current website? If you have an elementary website or even don’t have a website, then there are numerous factors that can be improved. You have to think like a customer of yours think about your website. A good way is to ask your trusted customers to give a review of your sites and asked them to give suggestions. If your business is listed on directories like Yelp or Yellow Pages then you may check out the review of your site from there. Keep one thing in mind that not 100% reviews are the right one. But at least 90% of them are helpful to analyze your site. In accordance with those reviews, you may then check your analytics and compare the problem. Check out which page gives you more conversion and which has a high bounce rate. Check out which keywords of those bounce pages either they have high search results or not. It might be possible that those keywords have a good search rate but the competition is high. So it is important to analyze what is wrong with you current site. 2. What are the goals of the redesign? Should I need to rebrand the company or should I just stick to a website redesign? If you are trying to rebrand your company, then the way to redesign your website is much more different than if you try keeping the same brand and just looking for a website makeover. A rule of thumb is to be followed should be “SMART” (Specific, Measurable, Attainable, Realistic, and Timely) goals for the website redesign. 3. What are some features of your favorite websites you want to include in your own? If there is some particular website in your mind that functions well for your navigational needs and is laid out in a way that makes sense, try to mimic that with your content. It might be possible that the website you are following has a design which fits for their products or services but it is not a good fit for your website. The best rule is to check out your competitors in your niche and try to follow those competitors who are doing well, but always try to remain ahead of them. 4. Has the product or service changed in any way? If the nature of the product or service has changed and your website needs a few touch ups, then this is a good time to consider doing a website redesign. This gives you a chance to get a new look for your website while unveiling the changes in the product or service. A new look is a great way to reinvigorate your business’ online presence and show your customers you are able to change with the times to stay relevant. The companies that fall behind in this area tend to lose followership due to stagnation. 5. How do I want the website to function? Do you want to redesign your website so that you generate more leads? You want to sell a different product or service, or want to attract visitor to the company’s physical location? Whatever the case will be, there are designs that work best to attract visitors, generate leads and convert those leads into customers. Identity this key aspect of your website redesign and you will be in the right direction to the success of digital marketing world. Whether you are going to overhaul your website or just want to revamp your whole site, there are many uncertainties when going through the process. 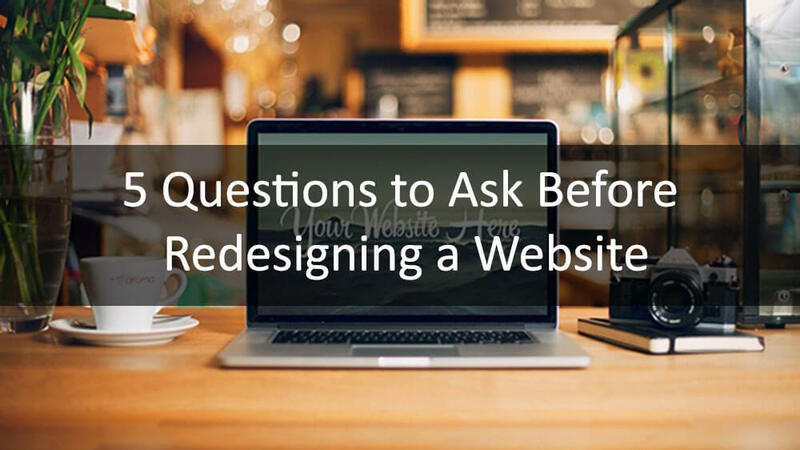 Ensure some of the most important questions are answered before redesigning your website. This saves both your time and money. Besides this, it will give you peace of mind.